Anybody who is working on Linux environment (not just developers), should understand the fundamentals of C programming language and write some basic C program. This article is part of our ongoing series on C programming language. The concept of pointers is one of the most powerful fundamentals of C/C++ language. Through pointers a developer can directly access memory from his/her code which makes memory related operations very fast. But, as always, with great power comes great responsibility. A developer has to very carefully make use of pointers in order to avoid some problems that can be nightmare to debug. In this article we will study the very basic concept of pointers with examples in C language. Different from other normal variables which can store values, pointers are special variables that can hold the address of a variable. Since they store memory address of a variable, the pointers are very commonly said to “point to variables”. Lets try to understand the concept. 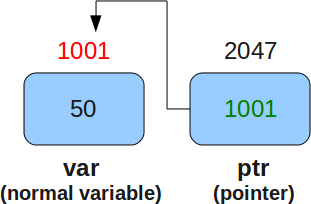 A normal variable ‘var’ has a memory address of 1001 and holds a value 50.
pointer-type : It specifies the type of pointer. It can be int,char, float etc. This type specifies the type of variable whose address this pointer can store. In the above declaration, ‘char’ signifies the pointer type, chptr is the name of the pointer while the asterisk ‘*’ signifies that ‘chptr’ is a pointer variable. How to initialize a Pointer? Note that the type of variable above should be same as the pointer type. (Though this is not a strict rule but for beginners this should be kept in mind). In the code above, we declared a character variable ch which stores the value ‘c’. Now, we declared a character pointer ‘chptr’ and initialized it with the address of variable ‘ch’. Note that the ‘&’ operator is used to access the address of any type of variable. How to Use a Pointer? A pointer can be used in two contexts. Context 1: For accessing the address of the variable whose memory address the pointer stores. Now, whenever we refer the name ‘chptr’ in the code after the above two lines, then compiler would try to fetch the value contained by this pointer variable, which is the address of the variable (ch) to which the pointer points. i.e. the value given by ‘chptr’ would be equal to ‘&ch’. The value held by ‘chptr’ (which in this case is the address of the variable ‘ch’) is assigned to the new pointer ‘ptr’. Context 2: For accessing the value of the variable whose memory address the pointer stores. We see that in the last line above, we have used ‘*’ before the name of the pointer. What does this asterisk operator do? Well, this operator when applied to a pointer variable name(like in the last line above) yields the value of the variable to which this pointer points. Which means, in this case ‘*chptr’ would yield the value kept at address held by chptr. Since ‘chptr’ holds the address of variable ‘ch’ and value of ‘ch’ is ‘c’, so ‘*chptr’ yeilds ‘c’. When used with pointers, the asterisk ‘*’ operator is also known as ‘value of’ operator. To debug a C program, use gdb. The above code covers all the common pointers. The first three of them are very trivial now to understand so lets concentrate on the fourth one. In the fourth example, a character pointer points to a string. In C, a string is nothing but an array of characters. So we have no staring pointers in C. Its the character pointers that are used in case of strings too. Now, coming to the string, when we point a pointer to a string, by default it holds the address of the first character of the string. Lets try to understand it better. Since characters occupy one byte each, so they are placed like above in the memory. Note the last character, its a null character which is placed at the end of every string by default in C. This null character signifies the end of the string. Now coming back to the point, any character pointer pointing to a string stores the address of the first character of the string. In the code above, ‘ptr’ holds the address of the character ‘I’ ie 1001. Now, when we apply the ‘value of’ operator ‘*’ to ‘ptr’, we intend to fetch the value at address 1001 which is ‘I’ and hence when we print ‘*ptr’, we get ‘I’ as the output. Also, If we specify the format specifier as ‘%s’ and use ‘ptr’ (which contains the starting address of the string), then the complete string is printed using printf. The concept is that %s specifier requires the address of the beginning byte of string to display the complete string, which we provided using ‘ptr’ (which we know holds the beginning byte address of the string). This we can see as the last print in the output above. In the above code, we have declared a pointer stobj of type ‘struct st’. Now since the pointer type is a structure, so the address it points to has to be of a ‘struct st’ type variable(which in this case is ‘obj’). Other interesting part is how structure elements are accessed using pointer variable ‘stobj’. Yes, When dealing with pointer objects, its a standard to use arrow operator -> instead of ‘.’ operator(which would have been used, had we used ‘obj’ to access the structure elements). To conclude, In this article we studied the concept of pointers in C from scratch and then slowly built upon our understanding to more complex topics like using pointers as structure objects. This was a basic tutorial, we will cover more complex pointer concepts in the part-II of this article. (Part 2: Advanced C pointers). Can we replace array by pointers? I can also help you guys if you need something..Lets make this more useful to programmers. Good intro. If readers are interested, a much more in-depth discussion can be found in “Expert C Programming: Deep C Secrets” by Peter van der Linden, but, as the name suggests, it is not for beginners. Thanks a lot for you valuable comments!! Your examples are good, but your explanations of the examples are the good stuff. BUT, ok, it’s lot of work, so let’s take it easy and wait for a wonderfull part 2 ! Thanks, I look forward to the second and well illustrated part of this article ! in pointer can we assigh any pointer name to adress of array . With ptr = &a[i], ptr will have the address of the i element of vector a. In other words, you’re making ptr point to some character of vector a. Your code ptr = &a should be ptr = &a. Assuming a has “I am a string”, from the example above, ptr = &a would print you only the string word. If you understand vectors, just think that a[i] is in fact *(a + i), this reads as “the value of the memory address a plus (incremented by) i”. What kind of examples you need? i think there is a mistake in one example of prog. there is missing * sign in ptr in 2nd example of prog. Pointer to pointers may be explained. it really helps me to understand. Hello, great article, got a good idea about pointer dec & init. Furthur more can you explain me how to do this. can I do so? My requirement is declare *C in struct and after initialize it. nice one..! short and clear..! very nice explanation for the beginners. This helped me to revise before the day of my exam….. thanks. hi frnds this is a wonderfull page..
very useful things it is very easy to understands……. good information about pointer. is good to know about pointers. excellent quick guide to pointers!!!!!!!! very very straight forward explanation. It’s really good to beginners…….. Thanks a lot.. It helped me a lot to understand!! This is very helpful to me, After all I gather some knowledge on Pointers. This will helpful for my further campussing too. the sentence ‘i am string’ has space betn each words. its very usefull thank u……………. Its too good..I like the approach taken to explain…thnks a lot…. Explain full details of pointer in c.
your explanation and examples are so good . It’s very nice for a Learner to write a c programme. After reading this you will be my teacher. Thank you……..
thanks a lot for this article every one easily understand the pointers concept……. At last! A basic pointers tutorial that explains the mechanics of strings with pointers. So many resources out there discussing the fundamental concepts of pointers but examples only use integers or single chars to illustrate. Those that do feature strings, often complicate the details by scoping in memory allocation and arrays unnecessarily. Thank you! nice content on this side. it helps me a lot. thank you. i am appreciate with your work. this article is very useful to me.so,I would like to say thank for that.